Venue: Community Room, Level 2, O2 Centre, 255, Finchley Road, London, NW3 6LU (Nearest tube stations: Finchley Road & Swiss Cottage). Time: 6.30 – 8.30 p.m. Invited Speakers: Tulip Siddiq (L.B. Camden Councillor and Labour Party Prospective Parliamentary Candidate for Hampstead & Kilburn). We have been establishing a promising network of contacts within the local Labour movement in support of our campaign, plus maintaining regular contact with the local press. As a concerted “final push” to build the Public Meeting on 21st November, I formally propose that we leaflet for this outside Swiss Cottage on Monday, 18thNovember. I f you would kindly let me know at your earliest convenience if you can spare any time on Monday, 18th (even if only for a short while), we can organise in advance accordingly. I shall also ask the staff if they can volunteer on their day off or during their breaks. A further bout of strike action has now also been called for Wednesday, 20th November from 2.30 – 5.30 p.m., so could also ask if you are able to come along to Swiss Cottage to do some more leafleting then? Thank you for your assistance: please do feel free to call me, if you wish. Regards and best wishes, GKW – GARY – C.W.U. Area Representative in P.O.L. CSCSM Area 12 – 07587138733/ Mobex: 53703418. Cc Andrew Dismore (LA Member);. Clllrs. Theo Blackwell, Sally Gimson, Tulip Siddiq. 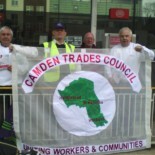 This entry was posted on November 15, 2013 by CAMDEN TRADES COUNCIL.